We’ve wandered there before, my friend and I, and we’ll wander there again. 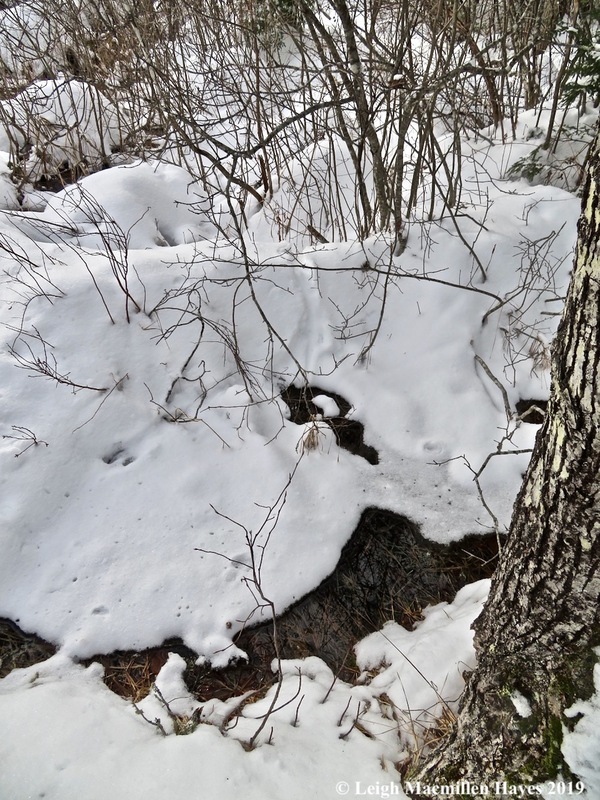 For as she said, “No matter how often we come here, there’s always something new to see.” And so it was that we found ourselves crawling over the crusty snowbank to get onto the trail of the Greater Lovell Land Trust’s Wilson Wing Moose Pond Bog Reserve. Virgin snow greeted us as we sauntered ever so slowly beside Sucker Brook, which drains out of Horseshoe Pond. All along, we were serenaded with water songs, but bereft of such from any birds, which seemed eerily odd. We did, however, have plenty of sights to admire, including the beaded fertile fronds of sensitive fern standing stalwart in the cold water. And then it dawned on us. Yes, the fern was standing in water. We know it prefers the edges of wetlands, but today’s offerings were at least ankle deep. And then we remembered. 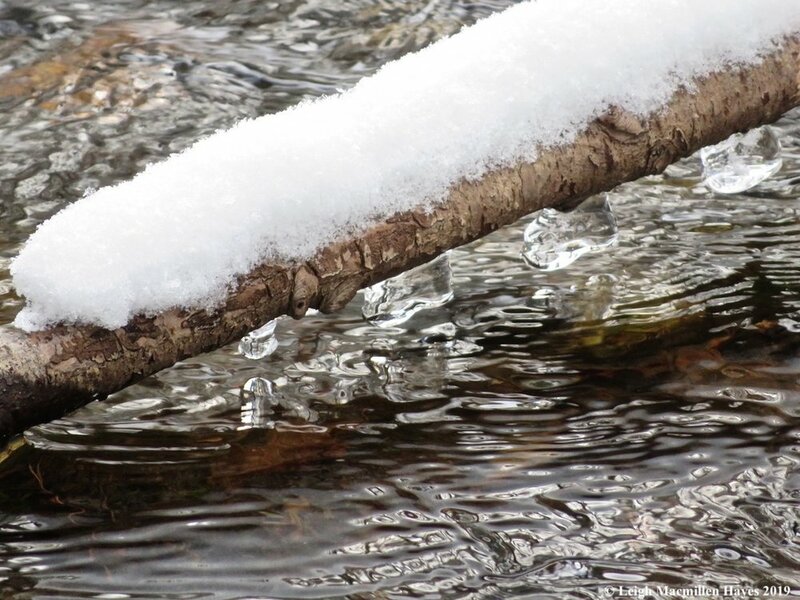 During the summer, it would have sprouted at the margin for the brook barely trickled through the landscape prior to the rain and snow that have fallen since then. As we stood there, we noted reminders of others, such as the basal leaves of the Cardinal flowers that grace the brook in late summer. Visions of their red heads danced through ours. And within our crowns, we mentally gathered the fertile fronds of royal fern. Already the days are lengthening and in a flash we’ll wonder how winter passed so quickly (well, some of us will) and dried brown leaves gave way to lush green. Then we let the brook gather our attention again. The late morning sun played with the water and snow-covered mounds, casting shadows to its liking–and ours. Beside the brook grow hardwoods and soft, but none were as brilliant as the yellow birch. Perhaps it was the glow of a winter day that encouraged their golden sheen to stand out among the rest. For a few moments we stood before one of my favorite yellow birches. I love how its spindly legs stand tall above the rocks in the middle of the brook. Today, all were but another memory as they stayed snug below the blanket of white. The boulders were also skirted in a coating of white, and hemmed with an icy floral display. Eventually, we moved on–but only a few steps at a time. In this wintry landscape one might think there is so little to see. And one might be wrong. The trees know, their bark displaying crustose lichens of various shades and shapes overlapped by frullania. Frullania is a genus of leafy liverworts that you’ll see on many a tree as it splays across the bark in a spiderweb-like manner. Each leaf consists of two parts, giving it a three-dimension look. On this particular tree it could have been a work of art–a scene that included the branching arms of a tree against a blue sky, the blue being a trail blaze. Given the conditions, the blazes were hidden by many works of nature. But staying on trail wasn’t always our focus. Between the two of us we spied one sight after another that begged to be noticed, like the fruiting bodies of a lichen possibly called Snag Pin that topped small stems sticking out perpendicular to an old tree stump. And then there was the fungi to note, like witch’s butter, this particular specimen reminding me of a duck posing in a frilly gown and crown. Almost hidden by the snow, an old false tinder conk with its cracked black upper surface sporting a velvety margin below. We also found tinder conks with their equally velvety spore surface, concave as opposed to the convex form of the false tinder conk. Both are known as a hoof fungus for their shape somewhat resembles that of a horse’s hoof. Somewhat. Perhaps this particular horse high stepped through the woods. 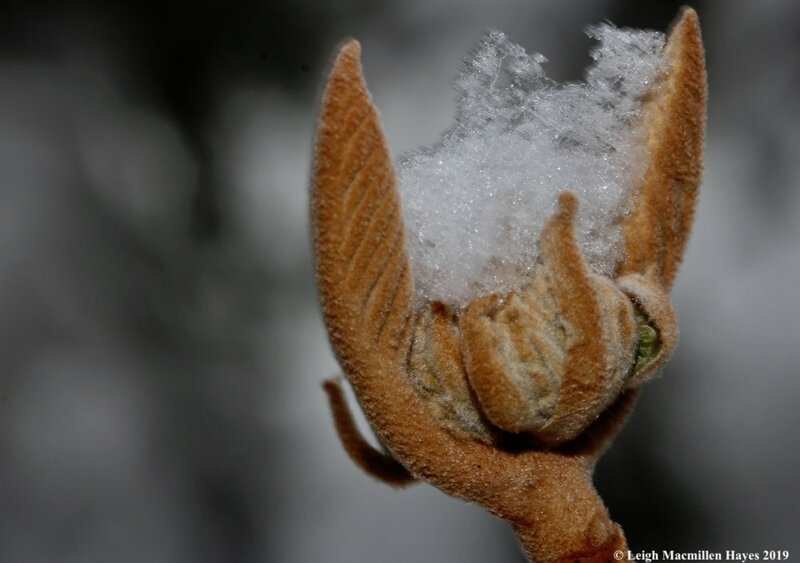 My friend’s affinity is more to the fungi, but she knew I was equally drawn to the hobblebush, their leaves tucked inside praying hands embracing the global flowerhead. Do you see the touch of green peeking out? Again, for those of you who would prefer to wish winter away, spring isn’t far off. It took us a while to reach the viewing platform along this not so long trail and we chose not to climb up. Our main reason for such was that we were curious to know if any others had traveled beside the water as well. 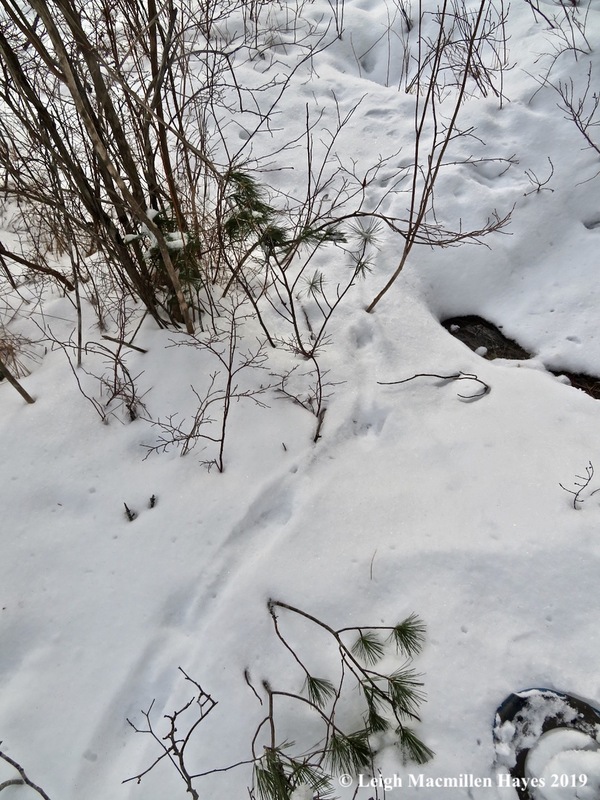 And we weren’t disappointed when we immediately spied mink tracks. If you look closely, you’ll also note a slide, for why bound all the time when occasionally you can take advantage of the snowy landscape and save some energy. And have a little fun. The Wilson Wing Moose Pond Bog Preserve was born prior to the organization of the Greater Lovell Land Trust. Outside the White Mountain National Forest, it was the first parcel to be conserved in the area. Behind the scenes, retired Episcopal Bishop and outdoor enthusiast George Cadigan, who summered in Lovell, encouraged his Lower Bay of Kezar Lake neighbor Wilson Wing to purchase some acreage along Sucker Brook in the early 1970s and donate it to The Nature Conservancy since the GLLT didn’t yet exist. Additional acreage was added in the late ’70s, but because the nearest office of the conservancy was located closer to the coast and the GLLT was beginning to take shape, the land was deeded to the land trust with the request that it be named for Mr. Wing. 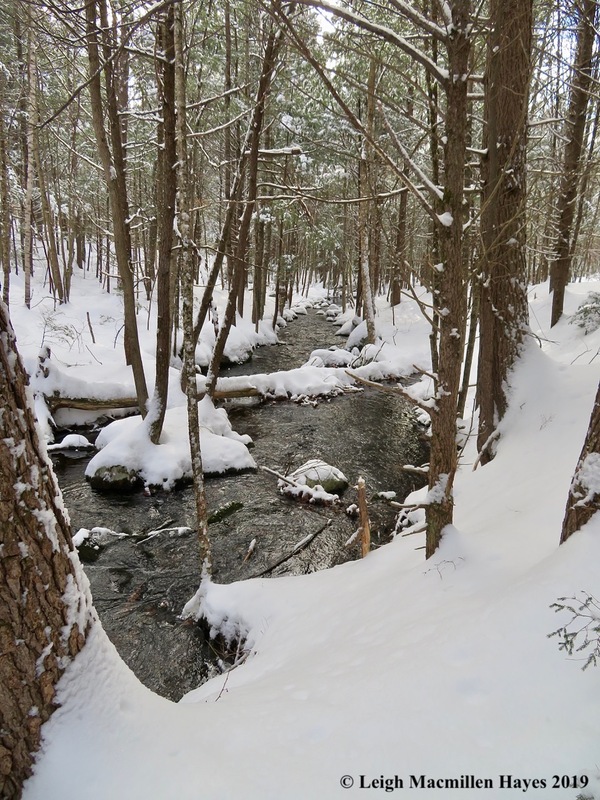 The 32 acres beside the brook is a preserve managed primarily in its natural state for preserves are deemed to be forever wild due to fragile ecological conditions. That means that when a tree falls at Wilson Wing, its voice will resonate in a variety of ways before it finally decomposes because it can’t be touched. It will serve as habitat to a variety of species whether on land or in water. Across the street, the Bishop Cardinal Reserve is managed to protect water quality and provide recreation and habitat. Today, I had the pleasure of meandering beside Sucker Brook with Jinny Mae in a fashion that I imagine Wilson Wing would approve–wandering the Wilson Wing way.